Most motorcycle gear has little-to-no spine protection. Even suits with decent spine armor rarely have anything that comes close to what Knox offers, and essentially no-one else offers CE rated chest protection for street-riders. Being a safety conscious chick who values her spine and internal organs I ponied up the money for this. The results are mixed. First off, this is really designed for men. The chest plate simply doesn’t accommodate any woman with a bust. 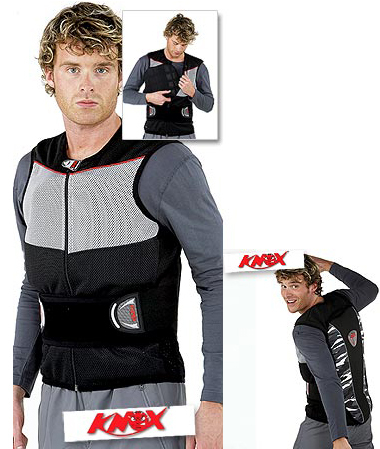 Also, if you’re pudgy, like so many Harley riders, I suspect this just won’t fit well no matter what size you order. However, if you’re in shape, and relatively flat chested, or male, you’ll have no problem. Their sizing chart worked for me and I’m very glad I consulted it, because I would have never chosen an extra-small otherwise as I normally wear medium or large tops. You can easily remove the chest piece, but there’s not a lot of point in buying the Gilet if you do that. If you just wanted the back protection they have a variety of back-only options. actually quite comfortable and gives me a reassuring feeling while riding down the road. The chest piece is so-so on comfort. It’s not uncomfortable, but it’s not comfortable either. The real problem though, is the closure at the top. I find that when I wear this under my Highland II (after removing the Highland’s back armor) the neck closure on the Highland (and probably any other jacket) presses against the neck closure on the Knox and pushes it against my breast-bone. After about half an hour it really starts to hurt and leaves a sore red mark. The only solution I’ve found is to not do up the top closure of the Knox. Similarly the zipper that holds the mesh snugly around the chest armor is by the top and points directly back at your chest. I haven’t actually had an issue with this but I suspect it might be a problem for some, and I thought that it was what was hurting me for a while before I moved things around and still had the pain. I really think this zipper should be moved to the front or replaced with velcro. Let’s be honest here. We’re talking about strapping large form-fitting pieces of foam to your torso. There’s no way this won’t increase the temperature. As I mentioned above the back piece is comfortable and gives me a reassuring feeling, but I do sweat somewhat under it, always. Surprisingly though, it doesn’t end up bothering me at all. The chest piece though… I tried so hard to like this chest piece. I want some chest protection, and that’s the main reason I got this (the Highland II already has CE rated back armor, although not as good), but I’ve pretty much given up on using it in the summer. I overheat to the point that I worry about heat stroke on long warm rides when I have the chest piece in. Not only do you overheat with it, but the sweat just kind-of stays there, feels uncomfortable, and can’t help cool you. It blocks air from getting to your chest, which is exactly what you don’t want to have happen on a hot day. And then there’s the belly band. Not only does it ride up but you can’t help but sweat under it. Ugh. Knox really needs to rethink the design of this chest piece. Dirt-bike riders have had chest protection for years and it always has air vents in it. I’m tempted to go to Home-depot, buy a half-inch drill bit, and go all Psycho on this thing, but it’s so small to begin with that I’m not convinced that what would be left would be worth wearing. There’s no reason the belly-band can’t be redesigned to be more breathable. I find that the back piece is large enough that it prevents the Gilet from fitting into most bags. As a result you’re stuck wearing it, and looking like a dork, or carrying it around, and looking like a dork, if you go into a store or restaurant. I’m hesitant to leave it in a bike bag (not that I have one it would fit in) because the thing costs $300. I would love to wave a flag and say “Buy This!”, because I think most people wear way to little armor, and this is a nice simple way to add some to your current gear, but I simply can’t. I think racer’s would do better with the Knox Contour and chest piece, and I just don’t see anyone who isn’t fanatical about wearing armor using this all the time. In the summer the chest piece is too hot, probably for anyone, and I’m sure there will be some people out there who are bothered by the extra sweating under the back-piece. Most women simply won’t be able to wear this comfortably at all. Knox needs to find a way to seriously improve the ventilation of this before I can recommend it. If you’re concerned about your spine, look into one of their other stand-alone spine protectors, but I’d pass on this unless you happen to find a really good deal on it. I’ll keep mine for winter use and when I have a ride-along who wants to feel safer, but for the summer I think I’ll switch to the Knox Kompakt (revamped version of the Stowaway) or just use the back armor that came with the Highland II.